Phil Pembroke selects his top ten fly fishing destinations in Spain (article first appeared in 'Fly Fishing and Fly Tying Magazine, June 2006). Variety and value for money are the key words when considering an angling holiday in Spain. A budget flight combined with a local angling licence for as little as €7.6 (£5) will gain you access to some of the best trout and salmon waters in Europe. AIl Spanish rivers are in public ownership and their management has been the responsibility of regional government since 1984. The regional government environmental department is called the Medio Ambiente and it provides angling licences and day tickets for the restricted fishing beats (cotos de pesca). These can be obtained from the main towns. There is often a ballot at the beginning of season to allocate fishing reserves: but leftover day tickets are also available in large quantities from local angling clubs, bars and petrol stations. The angling season in Spain varies between regions but in general stretches from March through September. Spanish rivers display a strong genetic diversity in native brown trout. River vallevs one kilometre apart mav posses their own sub species: with different colour patterns. This unique, diverse native gene pool is under threat from restocking (to combat over fishing) with too similar strains. One exception is in Galicia. Restocking here is carried out with greater subtlety, e.g. breeding hybrid strains by introducing genetically distinct German brown trout. ‘Pesca sin muerte’ - catch and release - is the way to go. When implemented local anglers have experienced an astonishing recovery in local fish stocks. Older Spanish anglers still prefer to fish for the table. But by choosing to fish water classified as catch and release you may have a whole top class water in a stunning location all to yourself for the day or even a week! Selecting my favourite top ten angling venues has been a struggle considering there are thousands of superb locations to choose from, but here goes. 1. River Cares at Panes, Asturias (salmon, trout and sea trout). This is the most breathtaking of the free fishing areas found in Asturias. The views of the river as you approach from above are spectacular, looking more like Canada than Spain, but even this does not prepare you for the power and clarity of this wild stretch of river with white boulder-strewn banks. Many free areas are not suitable for the traditional ‘au toc’ bait method practised by local salmon fishermen and so are often empty. They offer superb fly fishing sport. More salmon are caught in the Asturias than the rest of lberia put together. lt is common knowledge that the most famous fishing reserves are always over, subscribed. Don't forget, then, that there are ten times as many high-quality free fishing zones to choose from. The record salmon is 35lb caught in 1962. Directions: Take a small side road at Panes from the town-bridge on the left hand bank looking downstream and drive for about 5 km upstream then turn onto a rough farm track for a kilometer and down to the river. 2. Coto Tempramas, river sella at Cangas de Onís Asturias (salmon, trout and sea trout), a day ticket fishery. One of the most sought after fishing reserves in Spain. Good from April through June, but at its very best in May. Best fishing is in the 700m section from the Monasterio de Villanueva in Cangas de Onis downstream past Caño to a footbridge signposted ‘pasorela peatonal’. This area has very deep pools and rock ledges where fish like to lie up. The limestone rocks give the river a clarity and blue-green colour, somewhere between an alpine stream and an English chalk stream depending on the depth and the nature of deep fishing pools (tpozos), glides (tabladas) and riffles (torrentes). 68 salmon were caught here, making that its second best season over last thirty years. 1,082 salmon in total were caught from the river in 2005. Directions: travel on the N-634 and exit south at Arriondas N-625 past Cangas de Onis to Caño. 3. Coto de Sobrado, river Selmo, Castille and León. This is a small mountain day-ticket river with crystal clear water set in a stunning location. There are mostly hard fighting and plentiful brown trout but some huge rainbows up to 3lb in the upstream section that have escaped from the fish farm. June is the best time to visit. The stony bottom provides plenty of holding areas to target fish. The alder trees afforded good cover on the banks. During the early season, gold-headed Nymphs work best, but they must be weighted sufficiently to withstand the strong current. Dry flies to use include (dry flies in imitation olive and browns size 14 or 12 (secas son imitaciones de olivos y pardones). As the water warms up switch to a sedge (triceptero) size 16-20 in flesh, yellow or lemon, bright olive, salmon pink carne, amarillo limón, oliva clora, salmon). Fish from upstream at a bridge by a sports field, sign posted ‘Puente Cabeza de Campo’ until Puente Sobrado. The stretch is 5km long. Directions: take the 4-6, past Ponferrada if coming via León or exit just before Ponferrada, if coming via Lugo or La Corunna. Take the left turn towards Toral de los Vados on the N-l 20. ln a few kilometres there is a turn-off towards Valle del Selmo, by Friera, Sobrado and Cabeza de Campo. 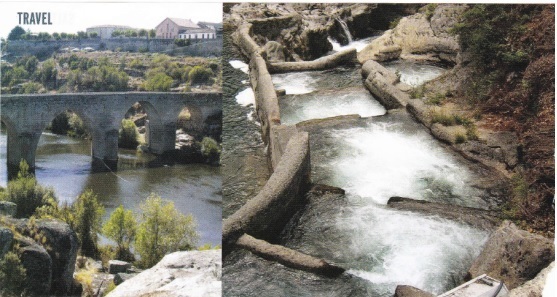 The river Tormes is the only Spanish river in which Huchen, a freshwater salmon, has managed to adapt itself completely to its surroundings. Until only a very few years ago its population density was quite high, with catches all along the river. This is the best fishing reserve on the river Tormes and it's day ticket. Fish from a power station, sign posted ‘azud de la central de Mirat in Villagonzalo’ until a bridge, sign posted ‘puente nuevo’ at de Encinas de Abajo. The fishing reserve is 6km long. The angling season for huchen is from the third week in May until 15th August. The best time for capture is start of the season at dawn. ln June 2003, ten huchen salmon were caught on this fishing reserve by just two anglers. The largest was 85cm in length and most were between 50cm and 65cm long. Salamanca angler lgnacio Hernandez de Vega caught a 44lb (18kg) salmon in 1993. The most suitable bait would be an artificial fish, although spinners (between 9-1 3cm long), streamers and flies should not be ruled out. Cast into slower current near the bank or into deeper pools. Directions: From Salamanca south-east take C-510 to Alba, then south SA-1 20 towards Encinas de Arriba. 5. Coto de Alfarràs,Río Noguera, Rtibaqorzana near Alfarras, Lérida province, Catalonia. One of the oldest and best day-ticket coto intensivo (stocked fishery) in Catalonia, it was established 25 years ago. lt is 12 km long, but divided into three sections. The upstream 3km section is the most popular, containing the largest fish; mostly rainbow trout up to 4l lb (although some reach 17 ½ ib! This is crystal clear water with an average channel width between 8--l 2m and a depth of less than 1.5m. lt is characterised by sections of strong current alternating with short glides (tabladas) and clear pools where the biggest fish hold up. Pink or salmon coloured nymphs work well here. lt's good downstream of the bridge by Alfarras. The morning's nymphing gives way at lunchtime to small segdes and upwings. Between 700-900 hard fighting rainbow trout are stocked every Friday, so it's a good place to take beginners or children. There's access for anglers with restricted mobility. Directions: From Llieida take the 230 norlh to Alfarras (about 20km). Catch and release, (rainbow trout, some brown trout). 7 metres average channel width. Easy place to fish, and there’s not too much bank-side vegetation. Day tickets available locally from: Hostal Domingo de Ademuz. Lots of good size rainbows up to 11lb. Dlrectlons: take Valbncia west A-3 exit north at Utiel N-330 to Ademuz, which is just south of Rincon. Visit from October until March when there are far less visitors about. The centre is open only at weekends. Catching a large tagged trout that the authorities stock at the lake during low season will secure a prize, e.g. one day's free angling. Good luck! a) Pesca Muerte (catch and keep) - €9 per day including first kilo of trout caught. Thereafter €4.8 for every extra kilo of trout bagged. b) Catch-and release (pesca sin muerte) - €1 5 per day. Directions: The lake is 200km west of València. From Cuenca head north for 20km on CM21 05 to Villalba de la Sierra. Contact: EL Tablazo, Camino de la Noria, s/n. Villalba de la Sierra (Cuenca). Tel.lfax 969 28 14 88. 8. Coto de RíoFrío, RíoFrío / Río Salado, Loja, Granada province, Andalucia. The coto is located in the north-east foothills of the Sierra de Loja, where there exists one of the largest aquifer water reseryes in Granada province. Fishing here dates back as far as1664 and recorded catches have been produced. Trout live in stretches of river where the channel flows through the undergrowth and past galleries of poplar, willow and eucalyptus trees. A good atmosphere to fish in, it's easy to catch rainbows around 2-4lb with the chance of some big 'uns up to 1 1lb. Open all year.10-fish limit. Total stretch is 4.4 km in length. The last 800m of the downstream section by the confluence with the private fishing reserye, is very good for nymph flies at dusk by the bridge. The larger fish are usually caught further downstream of the artificial pools. 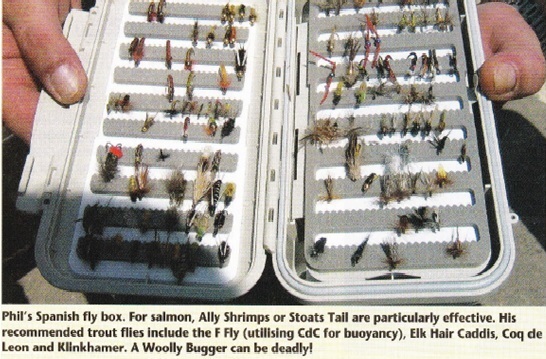 Use a weighted nymph in the morning then, at midday in summer try a dry fly e.g. efemeros and p/ecopteros. ln the Autumn dipterous (nymphs - tipilidos size12). Day tickets are obtained locally at: Alberge de Pescadores de Rio Frio, Riviera de Riofrio s/n 18300 Loja (Cranada) Tel, (0034) 958 32 3'l 77. 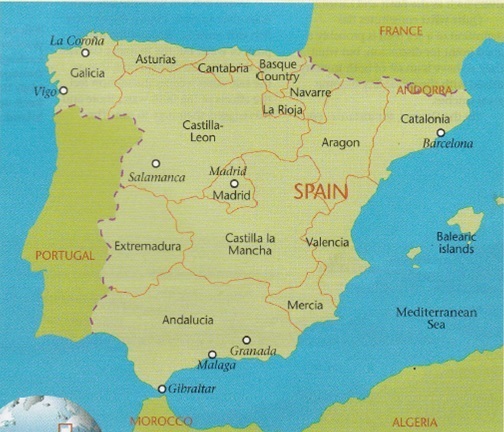 Directlons: The fishery is equidistant from Malaga and Granada on the A-92 motorway. 9. Coto de Pesca de Arive, Rio lrati Navarre. Catch and release. Fish from the Puente de la carretera de Arive downstream to the dam (signposted ‘presa’) situated downstream of the lock (exclusa) at Arive. Try fishing from the Puente de Arive to the first meander. 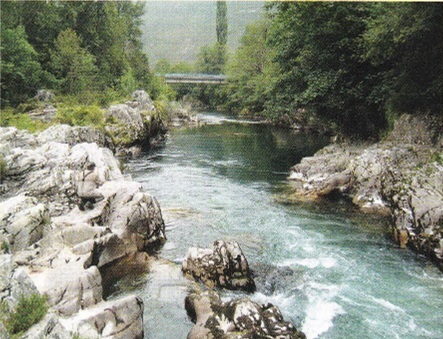 The ‘zona de la presa’ and ‘puente colgante’(suspension bridge) is less prolific, but holds larger fish, up to 43cm. 2.5km long, there are also two swims for anglers with restricted mobility located here. Potentiallt this is the best fly fishing river in Navarra. Specimens reach 75cm in length. Traditionally it has been a big fish river, many reaching 151b, especially from this particular coto. This was the location where the ‘guarderio de medio ambiente’ (river bailiff) saw a pescador sin muerte (catch-and-release angler) for the first time. 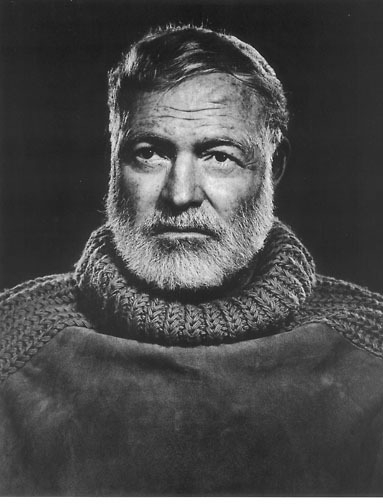 The fisherman was Ernest Hemingway. Heading for the nearest bar he declared: "The lrati is the best river in Europe. lt is the best river stretch in Navarra. I am tremendously excited by this river and its possibilities." Dlrections: From Pamplona drive north east via Burguete to Arive. 10. Rio Arenteiro. 0urense province, Galicia. This is the prettiest stretch on the whole river. lt is 4km long. Tramo situated before the confluence with the Rio Avia. Downstream of Carballiño the Rio Arenteiro is sensational. Especially good at the ‘pozo dos Fumes’. Directions: From Ourense drive north-west N-541 to Carballifro. Profile: phil Pembroke has fished all over the Iberian peninsula and can provide information on do-it-yourself fishing trips to Spain, Portugal and France via his fishing guide books available from his webpage: www.spainfishing. Phil can also point anglers in the right direction regarding fishing guides and accommodation for Spain and Portugal. Click here to download (and print out) article for free in PDF.